I’ve continued to use my custom-coded online app to track what I’ve been wearing every day. It is super-convenient to use and I’m happy with the ways I can slice and dice what time period I look across. Since I started tracking mid-Feb this year and already wrote up Feb-Apr, I’ll cover May through July in this post. Eventually I’ll even it out so the periods line up with the quarters of the year. I’m also going to combine my purchasing and tracking posts since, at least for this time period, almost everything I bought is covered in my #memade items post. In addition, I’ll mention the items I’ve sold as I’ve actually done quite a bit of selling this year as well. As it turns out, in this three month period, I only bought one ready-made item, which was a Jamie and the Jones slate T Top from the sample sale. Everything else was #memade. For more pics and descriptions, you can see my J+J review post and my second #memade reviews post. So that’s a total of 6 pieces and $250 for these three months. I’m very comfortable with this number and happy to be able to make #memade versions of the items I admire for a much lower cost. Five of these items are clearly winners and being worn all the time, and the Parabola-like top was meant to be experimental (I don’t seem to like wearing white all that much, but I like it in images of other people), so we’ll see if it grows on me. Three pairs of boots I bought last year thinking I’d like to have purses and boots in black, chocolate brown and cognac. It turns out chocolate brown and cognac are not really my colors for leather accessories and I never wore them, so I sold a pair of dark brown Fryes, cognac Luckys, and cognac peep toe heels. They were all adorable, and they were all rarely, if ever, worn. At least they were all purchase on eBay to begin with. I was able to sell everything for close to the same price I paid. Two Coach purses I bought at the same time as the boots — one in chocolate brown and one in cognac. Again, they were beautiful purses, purchased on eBay, never used. I’m happy to have them go to new homes. And again, I was able to sell them for the same price I paid. Three pairs of sandals I wasn’t wearing. Unfortunately, these were purchased retail and sold for a fraction of what I paid, but again, happy to have them go somewhere where they can get some use. 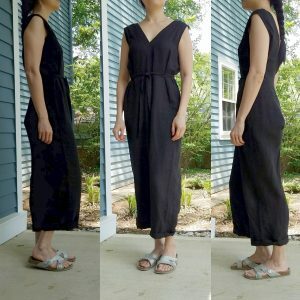 My Elizabeth Suzann silk Mara jumpsuit and charcoal linen gauze Harper. After making #memade versions of these items, I decided I no longer needed the ES versions. It’s nice to be able to sell these on selltradees at close to retail prices. | Overall size of my wardrobe | I ended last period with 116 items in my wardrobe and so far this period, I’m at 118. There’s still some churn in and out, but it’s a lot less than last year. As I continue to figure out what I like wearing, and also, through experience, get better at picturing how an item will or won’t fit in with the rest of my clothes, just by looking at it, I’m making fewer “bad” purchases. I am still letting things go from last year that haven’t quite worked out, but that’s ok. It’s all a learning journey, right? | Number of items worn | In May, June, and July, I wore 56 items. This is actually less than the number I wore last period, which is surprising. I had thought I wore more of my clothing during warm weather since I have more variety to choose from when I don’t have to worry about dressing warm. However, I’ve found I’m not that into dresses for work this summer, so I haven’t pulled those in much at all. It’s just too cold in the office for bare legs. Wish they didn’t have the AC cranked all the time! This definitely reads as a list of my very favorite items to wear. 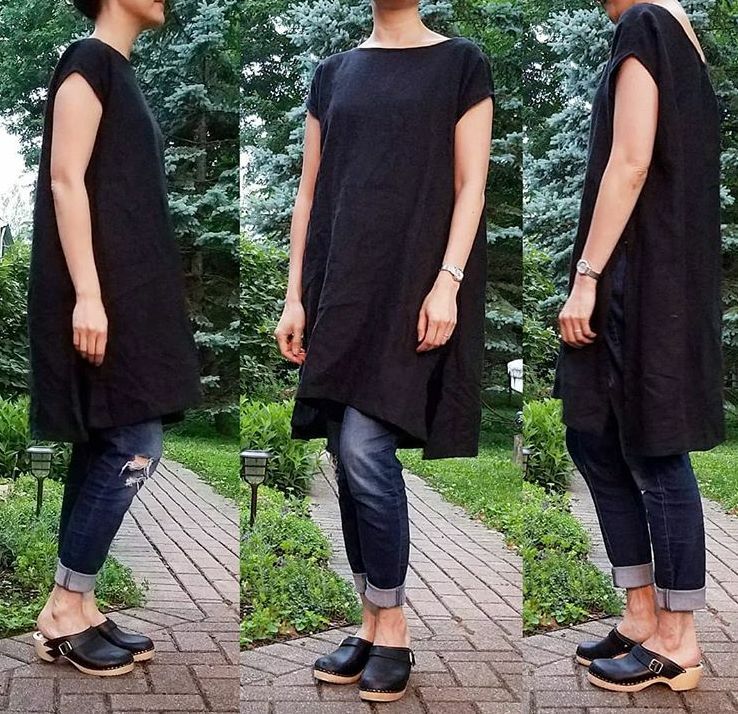 The J+J Pocket Box Tee (10) and T Top (10), the #memade Emma-like kimonos (21 and 6 wears), the jumpsuits (16 and 10 wears – seriously, I’m *all* about jumpsuits this summer), and the jeans (23) and Birks (46) that are my standard at-home items. The pointy black mules (30) and the Nisolo mules (12) are just about the only shoes I’m wearing to the office these days. They’re super comfortable and go with everything! | 30 day insights | I seem to hover somewhere between 30 and 40 items worn per month. In May it was 37 items, in June it was 31, and in July it was 38. It’s interesting to me to see the progression of most-worn items across the months. 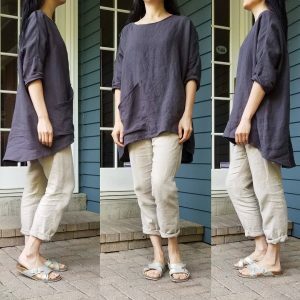 You can see I was excited to wear the Pocket Box Tee when I first got it, and then it moved into a more ‘normal rotation’ (6 wears in May, and then 2 in June and July.) The same thing happened when I dyed the Georgia tee and was happy with how the color turned out (3 wears in June and 4 in July.) Also, that pink color does feel more late spring / early summer to me, so that’s another reason it’s not getting worn as much as we shift to late summer. 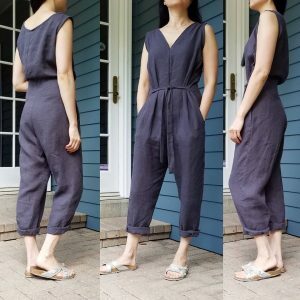 And, of course, the three jumpsuits get plenty of wear in this warm weather. I often come home from work and change directly in one of them for the rest of the evening. | Triggers are still a thing. | Seeing all the great outfit images on Insta definitely still triggers click-y shopping fingers for me. But I’m getting better about really thinking through whether something just looks good on someone else, or whether it would work for me and my wardrobe. I’m also more willing to experiment or just ‘give something a try’ when I can buy fabric and make a ‘close enough’ dupe for myself and play around with it. The T Top was somewhat of an impulse purchase because of J+J’s sample sale, but I have been quite curious about raw silk, so it was something I’d been thinking about too. 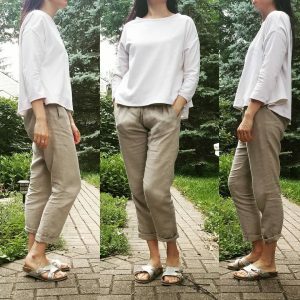 | This capsule wardrobe thing is really working for me! | Maybe 118 items would be considered a large capsule, but considering it includes outerwear and shoes, and covers 4 distinct seasons (from subzero temperatures to above 100), I think it’s quite streamlined. Certainly, I never feel overwhelmed by the number of choices, I have enough variety to keep things fun for me, and I also have gotten to a point that I’m perfectly happy to repeat an outfit every week if I’m just feeling it. I don’t do a ton of remixing or finding new ways to wear items, but that’s just not me. I hate fussing with things so once I find something that works well, it’s easiest for me to just go with it. | I’m spending less time shopping / looking. | Closet contentment is an actual thing, and I’m getting closer and closer to it. Posting on IG keeps me thinking about clothing more than I probably need to be, but I spend way less time shopping and considering clothing than I did a year ago. I am redirecting that time to reading, writing, knitting, baking and spending even more time with the fam, so it’s all good! | Posting my outfits pics on IG is really helpful to me. | I actually find it helpful to go back through my outfits pics to see what really works well, what’s a bit iffy, and to remind me of previous outfits I should re-wear. I find it’s a good way to shop my closet. And, of course, to connect to the wonderful community of like-minded sustainable fashion women online. It’s a wonderfully supportive and thoughtful group! Hi Karen, this is such a thoughtful post! I’m wondering how do you document your inventory and especially how do you keep track of your top worn items? 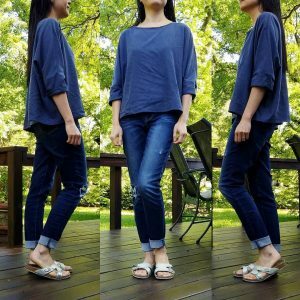 Do you take a OOTD pic everyday and keep a paper note? Or do you just enter things digitally on a tracker/form of some sort? Thanks. I want to learn what I wear the most and what styles flatter me the most as well, and eventually cut down spendings on clothes/buy less but better. Some of my posts contain affiliate links. If you click one and make a purchase, I will receive a small commission. These payments help with the costs of hosting the site and creating great content. Thanks for understanding!